If you are anything like me, you are always looking for new side dishes or salads, and interesting ways to use leftovers. This recipe covers all those categories. The mister and I are the only ones in our family that eat cornbread. When I make a pan there is always a lot remaining. 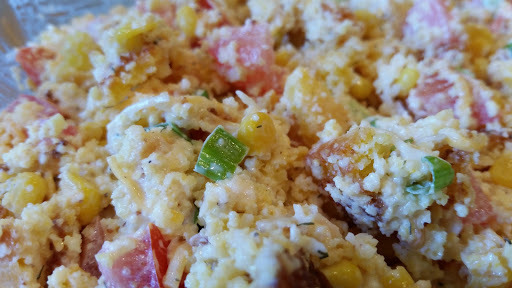 Cornbread salad has to be a recipe that was originated by someone who lived by the “waste not, want not” philosophy. It is also a recipe that is very flexible and can be adjusted to suit your own personal tastes. Experiment! The binder for this salad is a Ranch Dressing which can be made by using 1 1/2 cup mayonnaise and 1 package dry Ranch Dressing Seasoning. I decided to use a homemade Ranch dressing and it was worth the added effort. Pour the dressing over the cornbread mixture and combine thoroughly. 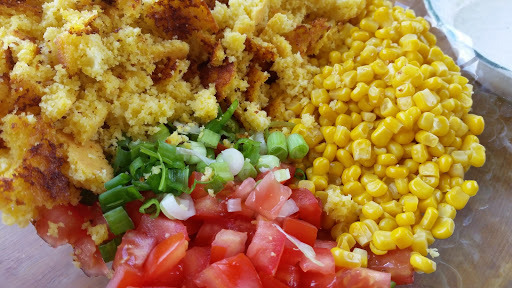 Depending on the amount of cornbread you have, you may have to add additional mayonnaise to make the salad moist enough. This truly is a recipe that you can make according to your preferences.